Here you will find coffee drippers for brewing pour over coffee. 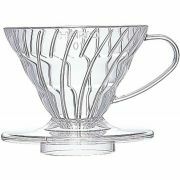 The coffee drippers from the Hario V60 series are available in different materials, including copper, glass, ceramic and plastic. 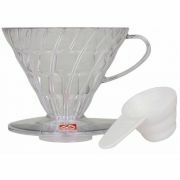 The Hario V60 series is available in three different sizes which are named 01, 02 and 03. The most common size is 02, which can be used to brew about 1 to 4 cups of coffee.